With medical device requirements becoming increasingly stringent, our strict quality control, impeccable machining precision, and a wide variety of material choices will meet and exceed all expectations. Our top-of-the-line, multi-axis, Swiss-style CNC lathes can provide our medical manufacturing customers with tolerances of ±0.0001in. Various surface finishes are also available, ranging from machine-finish up to 8µm. Additionally, with both Y-axis machining and programming expertise, we have the capability to produce incredibly complex geometries. If you have particularly stringent dimension and surface finish requirements,then you will be consistently pleased by our capabilities, regardless of the complexity of your required parts. The high level of reliability and precision required for medical instruments calls for manufacturing by a specialist precision medical CNC machine shop. With no room for error, the highest possible accuracy and consistency must be assured, produced in a strictly controlled, hygienic environment. This excellent repeatability needs to be maintained, even in high volume manufacturing, with optimized processes for shortest cycle times and efficient use of raw materials to reduce waste. Strict planning and preventive maintenance of reliable equipment ensures no delays. Our precision medical CNC machine shop features quality CNC cutting services and equipment capable of handling the wide variety of specialist materials required by the medical industry, meeting tolerances in the order of ±0.0001”. Material choices are critical in the medical field, and with extensive options for materials ranging from medical-grade Titanium to plastics such as Acrylic, our material capabilities are endless. We support production volumes ranging from 1 unit up to 100,000 units, and our experience ranges from small businesses who require single-part prototypes to large corporations requiring high volume production. The fine, complex nature of medical instruments requires expert engineering and CNC programming to ensure the highest possible accuracy in order to meet the standards expected by medical device manufacturers. A Swiss style precision CNC machine uses guide bushings to ensure the cutting tool is never far from the work piece, reducing the potential for errors due to deflection over distance, which is especially important in long, slender medical instruments and with the small-scale of final detail required in the finished part. The efficiency and speed of CNC machining allows quick, nimble and responsive production, yet still ensuring repeatability, even on high volume runs. Fast 3D prototyping capability speeds the development process and, when combined with high precision grinding and CNC cutting and machining capabilities, allows medical instruments to be produced and adapted, responsively, to customer demands. 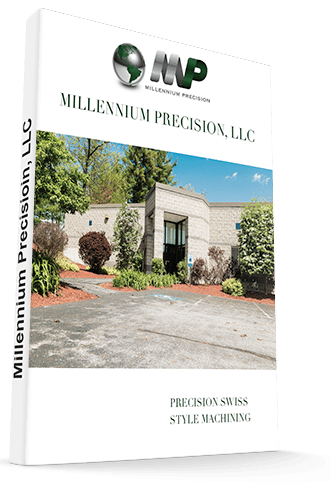 Millennium Precision has the resources to supply turnkey contract medical instrument manufacturing components requiring additional services such as heat treating, plating, grinding, polishing, and electroplating. Over the years we have built a strong network of suppliers in the industry that are always willing to support what our customer needs. Our supplier base is one of the best. Millennium Precision is proudly ISO9001:2015 certified, which guarantees stringent quality control standards. We guarantee that no part will exit the building without a meticulous inspection to ensure that the product meets and exceeds all requirements. Our inspection and documentation process can lead to valuable time savings for our customer’s when dealing with requirements associated with the medical field.